Numbers can frequently be found on silver beer steins made in the various European countries. While a few general rules exist, it is not always immediately clear exactly what percentage of silver is present in a silver beer stein. 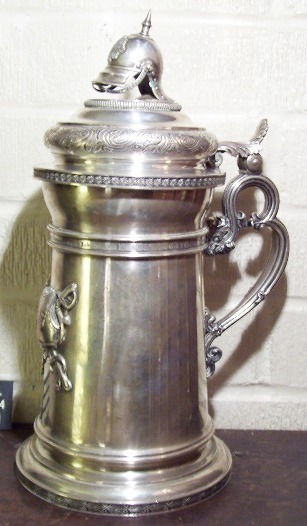 We can find silver beer steins with numerical markings such as 12, 14, 84, 88, .800, .900, .925, .925S, and . 830H. Some countries used very simple decimal systems while others used fractional systems with only part of the number stamped on the stein. An 1846 German military presentation marked 13 LOTH. 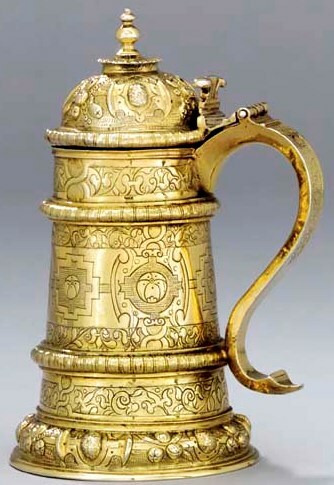 German silver steins from the 1600s to the early 1800s used a measurement system called Lothige (Loth for short.) Markings were numbers such as 12 or 14. These numbers were divided by 16. Thus 12 Loth is 12/16 or .750 silver content and 14 Loth is 14/16 or .875 silver content. This marking system went out of fashion and order by the late 1880s. Silver items made in Germany after 1888 are mostly marked .800 (this is 80% silver content- other contents are allow as long as the number so indicates. This .800 has become the standard for most silver pieces made in Germany from that time on. A small crescent moon and a small Imperial crown always accompany the .800 mark on German silver items made after 1888. Please note: The Imperial Crown does not indicate that the maker had something to do with the Imperial Court, as I have been told by many an antique dealer! Also do not assume that ’12’ or ’14’ necessarily means Loth. Silver-plating manufacturers in Germany have been known to use a simple 12 stamp into the metal with no connection to the Loth at all. Several lids have been seen carrying that numerical mark over the years. Electro-plating was invented in England in 1840 and was prolific in Western Europe by 1860. Since there was little if any control by the silver regulators, markings on silver-plated items can / do create confusion. American – Gorham Silver Co. mounts. We can see that all marks have a relationship to a standard that is based on 1000 parts and the most recent marks are directly expressed as parts per 1000. The most recognized silver mark is STERLING which is .925 or 925 parts per 1000. Sterling became the standard in the United States around 1870 when Tiffany & Company introduced English-made silver articles to their customers. Before that the standard in the United States was “Coin Silver” which was usually equivalent to .900 silver (but was sometimes only .800 silver. )At that time, American silver makers were not subject to the same type of strict quality controls as their counterparts in Europe. A silver gilt Elizabethan tankard which at one time would sell for more $$$’s than my house. Silver makers in England have used a Sterling standard since 1544 when they marked their wares with a lion passant. There are four or five required marks found on silver items made in England. One of these marks is used to indicate the Sterling standard. There were a few brief periods in which the standard in England was actually higher than 925/1000. 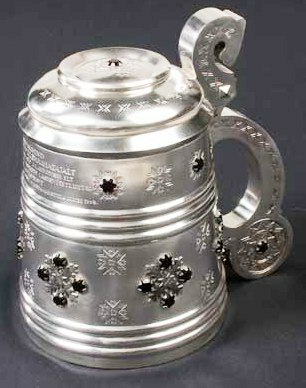 The other countries in Europe that made silver beer steins, or silver lids for steins made of other materials, all had their own silver standards. 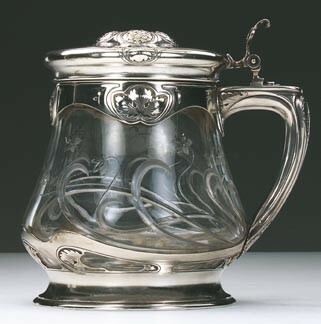 The silver standard is usually indicated on these steins and lids. An Austrian “columbine Cup”. [FWTD] These were “Master’s Cups” made to prove how good the journeyman was when he wished to become a Master in the local Silver-smith’s guild. Austria-Hungary, having an historically German culture, used the Lothige system. The marks that can be found on silver from these areas are 15, 14, 13 and 12, which equate to .9375, .875, .8125, and .750. Switzerland used the Lothige system until 1880 when they set standards of fineness at .935, .925, .900, .875 and .800. All silver items made in Switzerland after 1882 also have a bear or a grouse as part of the mark. France used a simple numbering system of .950 or .800. However, these numbers were represented by stamped marks that are variations of human heads. This is a somewhat confusing system as it usually requires reference to a book on silver marks. 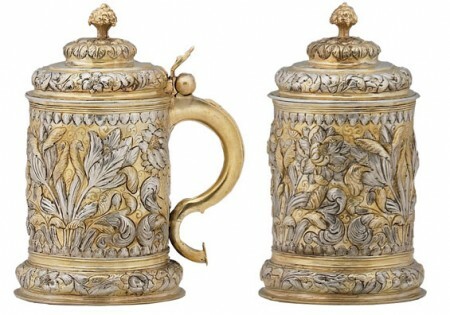 Since few silver steins were made in France, it will rarely be a problem for stein collectors. Starting in 1872, Italy used a similar marking system with female heads indicating .950, .900 and .800 fineness. More modern items produced in Italy used a flag with a number 1 (for .925) and a flag with a number 2 (for .800). 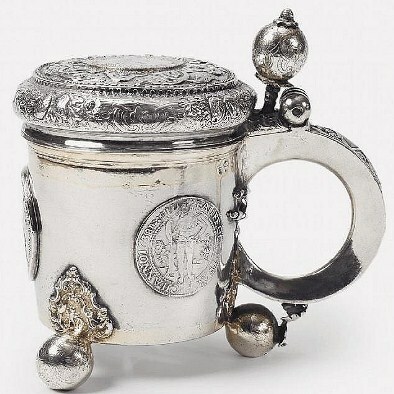 An early Danish silver “peg tankard.” The “pegs” going down the back, were used for measuring when the tankard was in a communal drinking game. From the early 1900’s Denmark’s silver standard was based on 1000 parts. There marks are followed by an S, such as 925S and 830S. The 830S mark is the most often seen mark on silver from Denmark. Finland added an H to the numerical mark, such as .925H, .830H and .813H. Belgium had a similar system with an A following the numbers, but they changed to a simple .900 or .800. Silver-gilt tankard, Dutch, early to mid 1600’s. 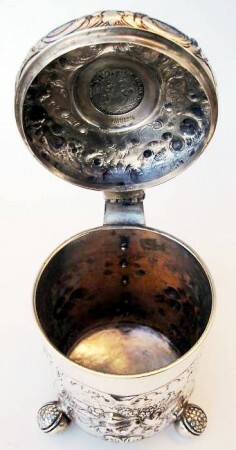 A Circa 1700, Swedish ball footed tankard. 8.75 inches tall. Gilded rim and center of lid medallion. The marking system in Sweden was based on “The Lod” which was similar to “The Loth” system with 16 being equivalent to 1000. The marking system in Sweden later changed to the 1000 parts system. Norway used a marking system similar to Sweden for older silver items. In 1891 Norway started using the 1000 part system with an S either before or after the number, such as S830 or 830S. In Norway .830 is the lowest allowed purity. Silver made in Russia was marked with numbers such as 84. The base or 100% pure number was 96, which was called a “Zolotnik.” An item marked 84 would be 84/96 or .875 pure silver. Other numerical marks that can be found on Russian silver include 88 (.9166 pure) and 91 (.9479). Russian silver was usually profusely marked. It is normal to find numerous marks on each part of an OLD Russian (and the old Baltic States) silver beer steins, including the body, the lid and the handle. 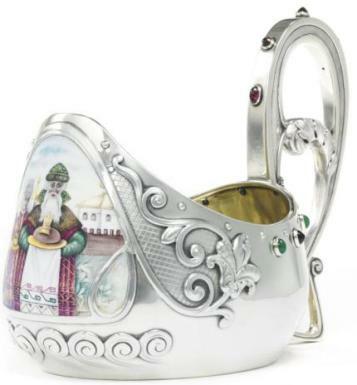 Estonian silver tankard with semi-precious jewels, Estonian usually have a larger than normal bottom finial on their handles . The Baltic states in the older days were parts of Russia and used the old Russian numbering system..They did not have the requirement to make every separate section of silver that the Russian silver-smith had to comply with. *Reprinted from The Beer Stein Journal, November 1994, by permission from Gary Kirsner Auctions.